Goodreads Summary: Life is quiet and ordinary in Amal’s Pakistani village, but she had no complaints, and besides, she’s busy pursuing her dream of becoming a teacher one day. Her dreams are temporarily dashed when—as the eldest daughter—she must stay home from school to take care of her siblings. Amal is upset, but she doesn’t lose hope and finds ways to continue learning. Then the unimaginable happens—after an accidental run-in with the son of her village’s corrupt landlord, Amal must work as his family’s servant to pay off her own family’s debt. Ricki’s Review: I read this book in one sitting. I’ve been thinking about it almost daily since I’ve read it. It’s an unforgettable story about a girl’s courage to survive. I don’t know her age, and although I suspect that the book is targeted by marketing teams for middle graders, it is quite simply a must-read for everyone. The book provides layers upon layers of themes and issues to consider. It made me think about privilege, freedom, education, and bravery, in particular. Amal is inspiring, and I greatly admire her courage in the face of adversity. When I was reviewing this book on GoodReads, I noticed that every one of my reader friends rated the book highly, and I am not surprised. Amal’s story is one that will stick with all readers. This is an important book. This is a book that will make your heart race. This is a book that I will read again and again. Kellee’s Review: This story affected me much in the way that Sold, A Long Walk to Water, Rickshaw Girl, or Queen of Water did. As we fight for so many injustices here in America, there are unimaginable things happening to humans in other places around the world. Often somewhere like Pakistan seems so far away, but then you read a story like Amal’s and you see that the gap between you and her is not that big and we all just want happiness in our life. Amal’s strive for knowledge and willingness to help others are traits that make her unforgettable mostly when paired with the bravery she shows throughout this book. Amal’s story will truly help readers look through windows (and possibly mirrors) and have to face the privilege we do have and the injustice others face. 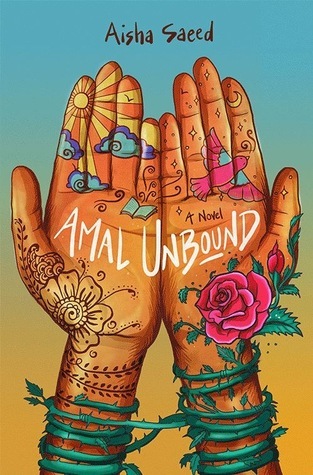 On top of the very important theme and amazing main character, the story of Amal Unbound is heartwarming as well as heartbreaking and heart wrenching. And there is a truly suspenseful part also! The story is definitely one that will keep kids reading while also doing all of what I said above. Teachers’ Tools for Navigation: Teachers could use this book as a read aloud, close reading/analysis, lit circle/book club, or classroom library text. It is rare that Kellee and I designate a book with all of these categories, but it’s a very adaptable text. It might be interesting for teachers to use this book as a whole-class read but using book groups. The groups could select a theme to study (e.g. education) and read other fiction and nonfiction related to the theme. This might allow for rich discussion across groups where they share their findings and teach each other. In what ways did Amal show courage? Did you agree with all of her actions? What is the role of education in this book? Which characters stood out to you? What made them three-dimensional? What is the role of family in the text? What do you think the author’s purpose(s) might be?